Toilets are among the most heavily used plumbing appliances in any home. Designed to work efficiently and provide years of trouble free, hygienic service, they’re an appliance we all rely on. We don’t really think about them until something goes wrong. And sooner or later, something will. Over time, the internal components --particularly the flushing mechanism inside the tank—wear down. You suddenly have a the toilet won’t flush properly. And leaks can also develop in the water line where it enters the tank, or in the seal joining the tank to the bowl. When water starts leaking from either of those points it will run onto the floor, and then you need a local, reliable plumber....fast. Your toilet may also develop a leak inside the tank. When that happens, the toilet will "run," slowly draining from the tank into the bowl and out through the toilet drain. That causes the water level inside the tank to be constantly dropping, so fresh water keeps running into the tank. Sure, it's annoying, but because the leak doesn’t wet the floor, it’s easy to ignore. And that means wasting tens of thousands of gallons of water each year. It's cheaper to fix it! We’re sure you’ve heard that toilets account for a good percentage of your everyday water usage. The typical old-style toilet uses about three to four gallons of water with each flush, while new, low–flow toilets use less than half that amount. In fact, a low–flow toilet can save the average household over 20,000 gallons of water a year. Add in the extra water wasted by the leak, and you can see your water bill rise dramatically. Time to Replace Your Toilet? Newer toilets have larger bowls and larger drains to clean the bowl efficiently with less water. Some models also rely on air pressure, forcing the water through the bowl for more cleaning power. Then, there are also dual–flush models, where separate flush cycles handle solid or liquid waste. 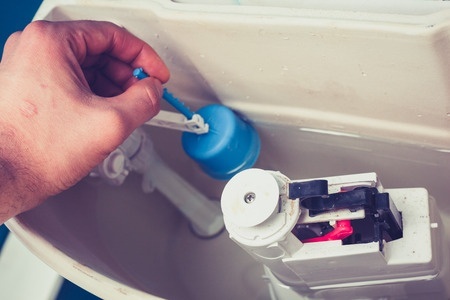 If you’re ready to replace your old toilet, consider upgrading to a low–flush toilet. You can save money and greatly reduce your water consumption. A "running" toilet, or a toilet leaking water onto the floor can be quickly fixed by one of the Greeley-based Troudt plumbers. Give us a call when you need us, and we’ll set up an appointment for you. We handle all types of toilet repairs, including low flow or dual flush toilets. Whether you’ve got a blocked toilet, a leaking or "running" toilet, or a toilet that won’t flush properly, Troudt can fix it. Contact us today for repair or replacement.